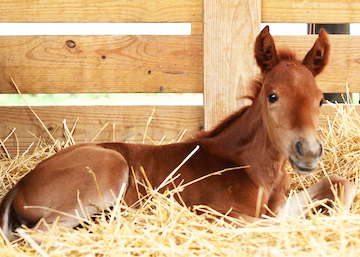 We had an astounding 142 qualified entries in our 2015 Foal Photo Contest! There were 29 different breeds and 6 breed crosses from 25 states and 2 countries. And, 345 people logged in to our website to vote! ​1st Place – Clyde’s Girl, barn name “Bonnie”, a Thoroughbred foal owned by Denis and Michelle Murphy in Bohemia, New York, is 2015’s Cutest Foal. 2nd Place – Shining C Diamonds, a Quarter Horse foal owned by Cassidy Cobarr of Shining C Grulla Horses in Wolfe City, Texas, is our 2nd place winner in the Cutest Foal category. 3rd Place – Willow, a Quarter Horse foal owned by John Deihm of P n L Ranch in Hollister, California, is our 3rd place winner in the Cutest Foal category. ​1st Place – Clyde’s Girl, barn name “Bonnie”, a Thoroughbred foal owned by Denis and Michelle Murphy in Bohemia, New York, was also the winner of 2015’s Most Personality category. ​2nd Place – Rivendell HFH, barn name “Della”, a Hanoverian foal owned by Mary Jane Todd-Day of Huntington Farm Hanoverians in Hutto Texas, is our 2nd place winner in the Most Personality category. ​3rd Place – Shining C Diamonds, a Quarter Horse foal owned by Cassidy Cobarr of Shining C Grulla Horses in Wolfe City, Texas, is our 3rd place winner in the Most Personality category. ​1st Place – Ghostwind Epic, an Appaloosa owned by Crystal Stock of Ghostwind Appaloosa in Caledonia, Ohio, is 2015’s Most Colorful Foal. 2nd Place – Splash of Shining C, a Quarter Horse foal owned by Cassidy Cobarr of Shining C Grulla Horses in Wolfe City, Texas, is our 2nd place winner in the Most Colorful category. ​3rd Place – Bonjour ‘Amour TCE, a Rheinland Pfalz-Saar International foal owned by Danielle Castano of Turtle Creek Equestrian in Delray Beach, Florida, is our 3rd place winner in the Most Colorful category. Bonjour ‘Amour TCE is for sale; you can contact Danielle at turtlecreekequestrian@gmail.com for more information about this foal. ​1st Place – Clyde’s Girl, barn name “Bonnie”, a Thoroughbred foal owned by Denis and Michelle Murphy in Bohemia, New York, made it a triple win by also taking 2015’s Best Action Shot category. 2nd Place – Willows Rena, a Norwegian Fjord foal owned by Corinne Logan of Willows Edge Farm, LLC in Kuna, Idaho, is our 2nd place winner in the Best Action Shot category. ​3rd Place – Axcellent, an Arabian foal owned by Karen Berk of ERS Stallion Station in Ocala, Florrida, is our 3rd place winner in the Best Action Shot category. Axcellent is for sale; you can contact Karen at ERSMobileAILab@aol.com for more information about this foal. Cutest Foal – Hijinks SSH, a German Riding Pony foal owned by Lisa O’Brien of Seguin Sporthorses in Seguin, Texas, is the top choice by ELS staff for Cutest Foal. Hijinks SSH is for sale; you can contact Lisa at holsteiner@gvec.net for more information about this foal. Best Action Shot – Jack, a Paint foal owned by Ken Hobbs in Maricopa, Arizona, is the top choice by ELS staff for Best Action Shot. Most Colorful – Ghostwind Epic, an Appaloosa owned by Crystal Stock of Ghostwind Appaloosa in Caledonia, Ohio, is the top choice by ELS staff for Most Colorful. Most Personality – FCF Chief’s Patriot Son, a Gypsy Cob foal owned by Zach Boehmer of First Class Farms in Grants Pass, Oregon, is the top choice by ELS staff for Most Personality. Each of our beautiful personalized leather prizes is handmade to order in Kentucky. First place in each category will receive a leather weanling halter with solid brass hardware and a commemorative brass halter plate. 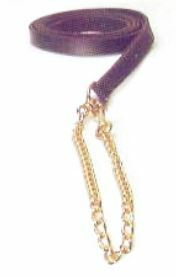 Second place in each category will receive a leather lead with a 20” brass chain and a commemorative brass nameplate. Third place in each category will receive a leather key ring with a commemorative brass nameplate. 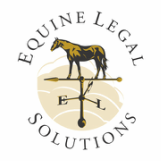 The Staff’s Choice Awards are presented to the top pick in each category as voted on by Equine Legal Solutions’ staff. Winners of the Staff’s Choice Award in each category will receive a one-of-a kind horseshoe nail pendant, handmade by one of our very own staff members, with a stone or bead in their choice of available colors. Pendant shown is an example only; actual stone or bead will vary and the award includes a sterling silver chain. Thank you to everyone who graciously shared their babies with us in this year’s photo contest, especially those who have entered their new babies in our Foal Contest for the last several years! Didn’t get your photos in this year? Please keep our annual contest in mind for your 2016 babies!! 345 people voted in this year’s Foal Contest! We hope that you will be back to vote next year, and maybe even send in a photo of YOUR new foal to be part of the contest!